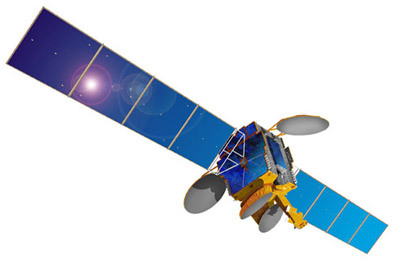 Space Systems/Loral's (SS/L) Apstar-2R is one of the most powerful spacecraft in Asia-Pacific service. Launched in China in 1997 by APT Satellite Company, Ltd., the satellite offers regional voice, video, and data services to an area large enough to link Europe, Russia, the Middle East, Africa, and the Asia-Pacific region into a broad telecommunications network. Apstar-2R's powerful payloads make it possible to establish an inexpensive direct-to-home satellite-based telecommunications network in China through the use of small diameter receiving dishes. SS/L expects that major U.S. and international programmers will provide programming for such a service. The geostationary satellite provides coverage to an area ranging from Central Europe to Japan, and from northern Russia to South Africa and Australia with one C-band beam with 28 traveling wave tubes rated at 60 Watts each. China is served with Apstar-2R's two Ku-band beams, with a total of 16 traveling wave tubes at 110 Watts each. The satellite boasts total on-board transmitter power of 3440 Watts. The new spacecraft replaces APStar-2, manufactured by Hughes, which was lost in a launch accident in early 1995. The Apstar-2R high-power satellite is based on SS/L's thee-axis, body-stabilized SSL-1300 bus. Apstar-2R was launched aboard a CZ-3B.